Why won’t HSE treat cancer seriously? The UK is ignoring an occupational cancer epidemic and needs to put far greater efforts into preventing work-related cancer deaths, a top workplace health researcher has said. Simon Pickvance, who is researching occupational bladder cancer risks at Sheffield University, believes this cancer illustrates a flaw in HSE’s figures that systematically disappears real cancers from the statistics, by dismissing or ignoring risks by job, by industry or by substance. 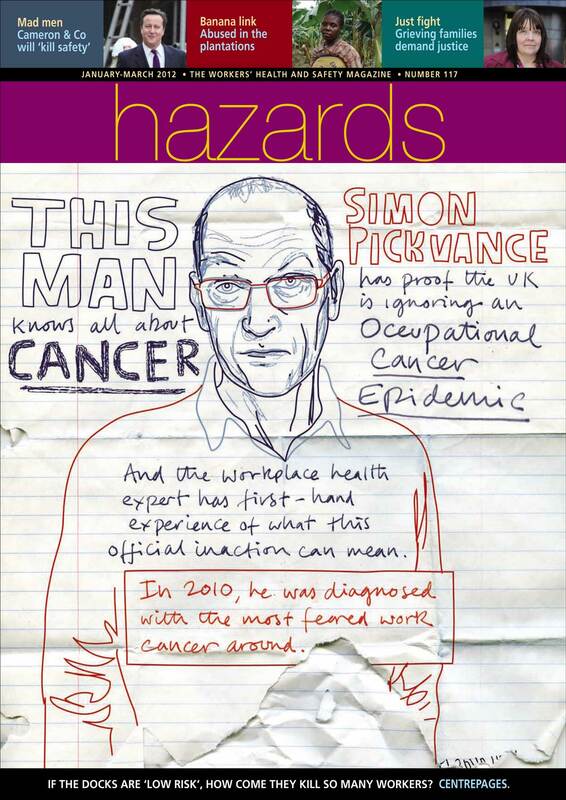 In an interview in Hazards magazine, due to be published next week, Pickvance says figures published by the HSE suggest over 500 people develop occupational bladder cancer each year, and around 250 people die of the work-related condition. However, he says this is based on an unjustifiably short list of substances and occupations linked to bladder cancer. HSE included exposures to just nine substances, for example. Pickvance lists 29 substances where the evidence of a bladder cancer risk is “strong” or “good”, and 18 others where the evidence is present but “limited”. He says a series of other exclusions mean the HSE total dramatically underestimates the real toll, a claim he believes is borne out by other research which has confirmed occupational bladder cancer risks are far more extensive than admitted by HSE. The same problem is repeated for other work cancers, Pickvance says, and could explain why HSE fails to address the problem with the required seriousness. “There’s less of a campaign now than five years ago, just a few gestures. There’s a pervasive lack of willingness to believe things are dangerous – it’s a cultural problem in HSE,” Pickvance concludes. He warns that even HSE’s estimate suggests cancers caused by work kill one person in the UK every 30 minutes around the clock, adding this alone should justify a well-resourced drive to identify and address problems through a “precautionary” approach. It is a message also voiced by TUC. In February, the union body called for greater efforts to prevent cancers, through removing the cause from the workplace, better standards and enforcement and greater union involvement in finding solutions.